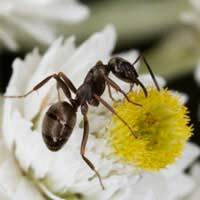 Ants are social insects and live in organised colonies containing three distinct types of individuals – workers (infertile females), males and a single queen – which look different from each other and have quite different roles in ant society. The queen is the heart of the colony and only she can produce eggs. The black – or garden – ant (Lasius nigeris) is a dark insect, the workers being around 5mm in length, the queen being some three times longer. Their nests are usually in the soil and often beneath slabs or stones in a sunny area of the garden and can usually be spotted by the collection of finely powdered soil around the entrance holes. The ants mate on the wing. The swarms of “flying ants” sometimes seen emerging from their nests and taking to the air in mid- to late summer are males and immature queens. They breed in flight, the males dying shortly afterwards, while the young queen will find a suitable spot to set up a new colony of her own. She will hibernate through the winter, beginning the serious business of egg-laying in earnest, the following spring. During early summer, foraging workers sometimes enter houses in search of food to feed the growing numbers of young. Though they rarely invade in large numbers, their habit of following well–defined trails from food sources to the nest and back again, can make it seem as if your kitchen is in danger of being over-run. However, these unwanted visitors can be dealt with in a number of fairly simple ways. One of the most effective ways of dealing with an ant invasion is to stop them getting what they came for in the first place – something to eat! Ants are notoriously determined on the trail of food and have an almost Houdini-like ability to defy apparently impenetrable jars, being small enough to enter containers by even the tiniest gap. Ant-proof storage requires truly sealable vessels and the constant diligence to make sure they are fully sealed up again after every use. Although they chiefly seek out sweet and syrupy things, they will also take protein-rich foods – so meats, pet-food and the like also need protection. Kitchen scraps and waste need similar treatment too – and regular cleaning of surfaces and the floor will stop any spillages making an easy meal for them. It is also helpful to identify where the ants are entering the house – and seal them off, either by filling in the gaps, or by some kind of barrier. Ants will not cross sticky barriers and a variety of these are available commercially, or can be home-made using petroleum jelly, for example. Physical attacks on individual ants are of little use, but boiling water poured – with care – directly on the nest itself can be more useful, if its location can be found. Although this is only a temporary measure – and unlikely to succeed without other steps being taken as well – it can give a period of temporary respite while other measures are put in place. Chemical control methods can prove very effective in this respect, though as always it is important to use all pesticides in strict accordance with the instructions. A large variety of insecticides suitable for ant control are routinely available, which come as sprays or in powder form. Another type of product, “ant baits”, turn the insects’ own natural behaviour against themselves and can destroy the entire colony. These products work by exploiting the ants’ natural food sharing – the bait contains a slow-acting toxicant which is passed from ant to ant throughout the nest, eventually killing the entire colony, including the queen herself. Since ant baits must first be picked up by foraging workers and carried back to the nest, this is a relatively slow method and obviously it will not work as well if other sources of food have not been denied them – as outlined previously. Sharing your larder with these uninvited guests has little to recommend it, but in most cases a few simple and effective strategies will soon have them sent packing and your kitchen all your own, once again.